Without sulphates, Coslys Organic Hypoallergenic Shampoo has been specially formulated for the most sensitive and fragile scalps. Respectful, it gently cleans the hair without attacking and nourishes the hair fiber. Composed of organic peach leaves, it wraps your hair with a sweet fruity scent. Your hair is soft, shiny and soft! 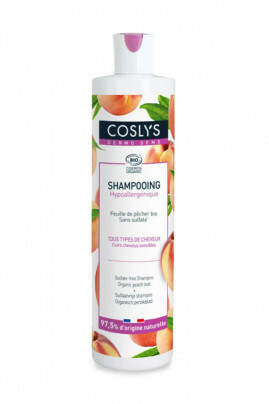 Take care of your scalp with Coslys Organic Hypoallergenic Shampoo! Coslys Organic Hypoallergenic Shampoo is ideal for sensitive scalps! Apply a small amount of this natural shampoo to your wet hair. Lather by gently massaging your scalp. Rinse thoroughly to remove any traces of shampoo. In case of contact with eyes, rinse with clear water. For a ritual of organic hair care and to strengthen the softening actions of this shampoo, we advise you to apply on your hair Coslys Organic Hypoallergenic Conditioner. If you have fragile and sensitive skin, the Hypoallergenic Shower Cream is the organic hygiene product you need! Healthy hair thanks to a natural and organic composition! Aqua (water), spiraea ulmaria flower water *, sodium cocoyl glutamate, cocamidopropyl betaine, decyl glucoside, sodium chloride, inulin, glyceryl oleate, coco-glucoside, acacia senegal gum, prunus persica (peach) leaf extract *, xanthan gum, glycerin perfume (fragrance), aloe barbadensis leaf juice powder *, guar hydroxypropyltrimonium chloride, sodium benzoate, sodium dehydroacetate, levulinic acid, sodium levulinate, citric acid.